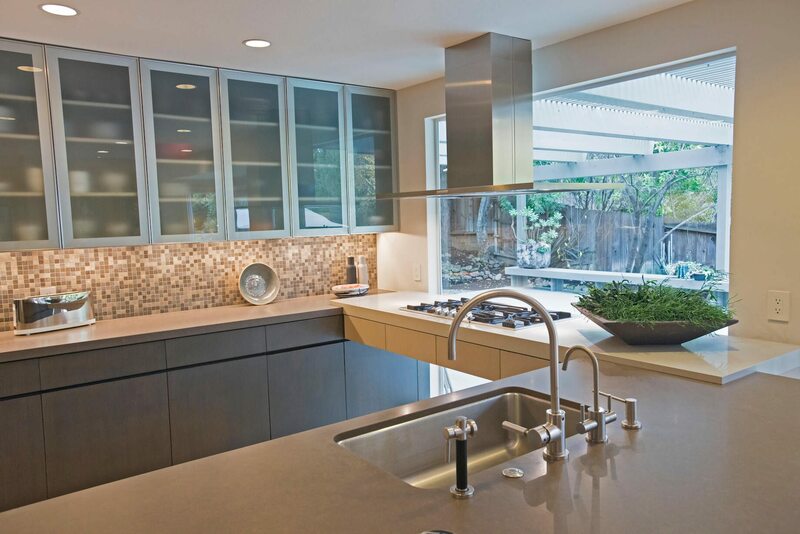 The kitchen of this residence has a beautiful patio often used as an outdoor room for entertaining family and friends; however, the original kitchen’s only connection to the patio was a small window. 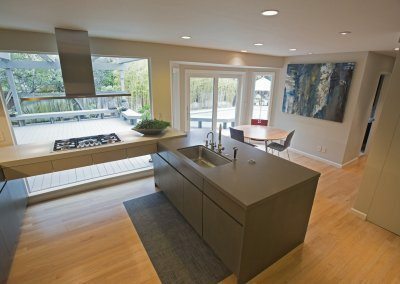 The solution was one of perception and rethinking the kitchen layout. 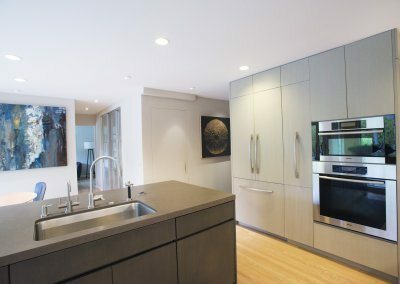 The kitchen’s existing small window was removed and a floor-to-ceiling, picture window was installed that now encompasses the kitchen’s entire exterior wall. 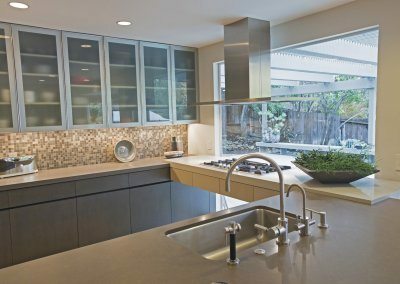 The window provides a strong visual connection to the outdoor patio with the added benefit of additional natural light into the kitchen. 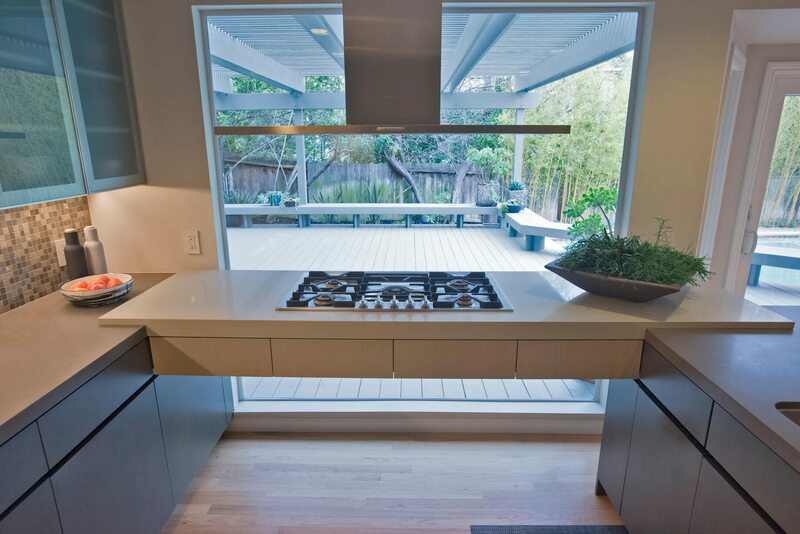 Parallel base cabinets were designed away from and not across the new window. 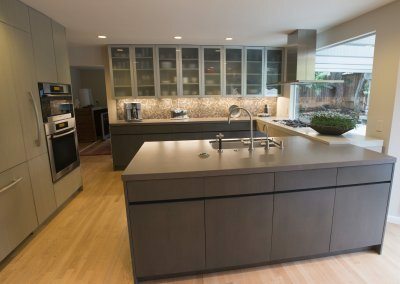 The use of wall cabinets was intentionally limited and do not impair any perspectives between the kitchen, breakfast room and patio. 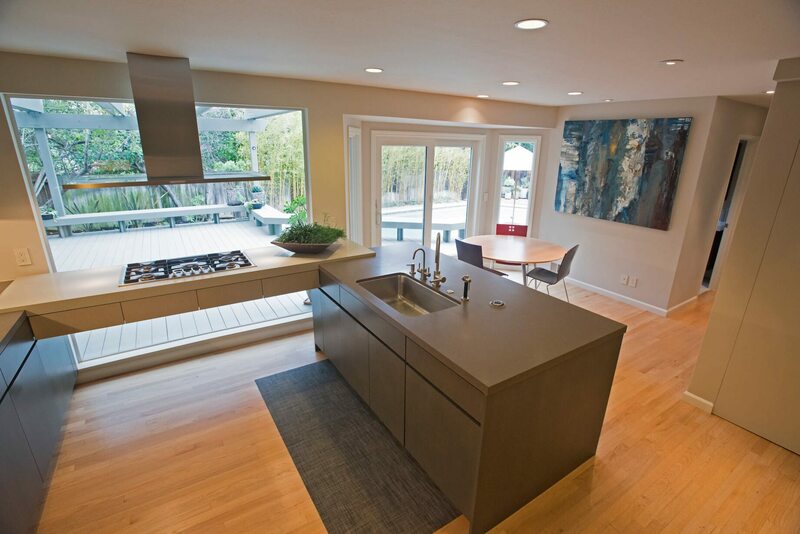 A suspended countertop equipped with a Miele gas cooktop extends across the window between the base cabinets. 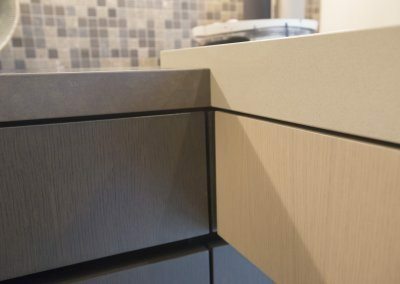 Two distinct colors of quartz were chosen for the kitchen’s countertops, one for the suspended cooktop and another for the base cabinets. 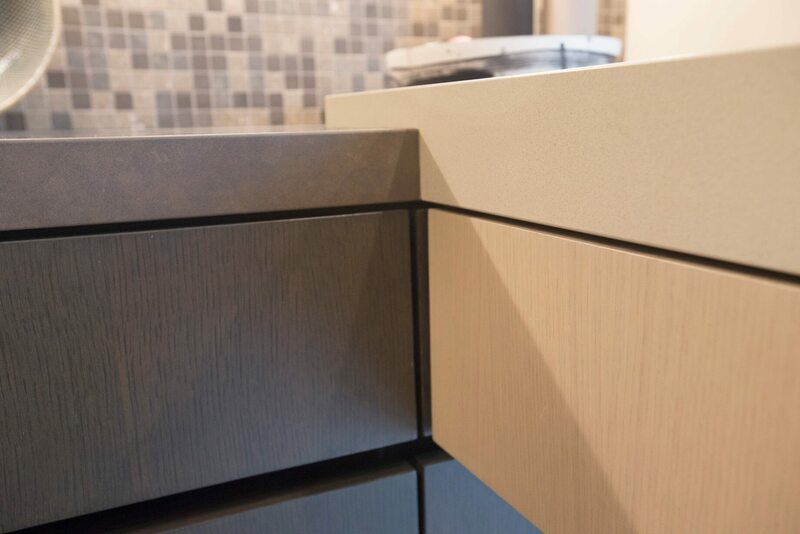 A geometric step intersects where the two countertop colors meet at each end. 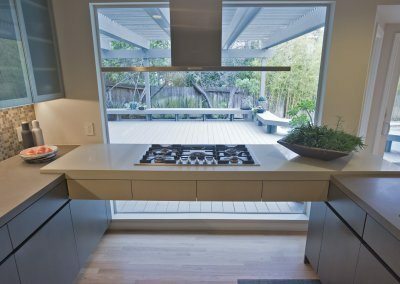 The new picture window is framed by two succinct horizontal lines created by the suspended cooktop counter and the sleek Zepher hood. 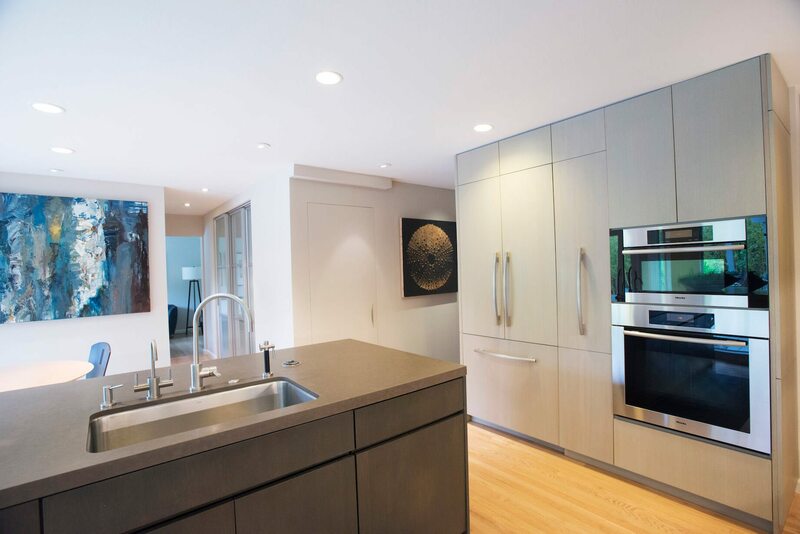 Three distinct finishes and complimentary cabinet styles were used to define each area of this contemporary kitchen.